When last I wrote, I spoke about the tears, the terrible sadness, evoked by the terrorist murder of Ori Ansbacher. That sadness is still in my heart, and in the heart of everyone here with whom I speak. But it is fury that has now risen to the fore. 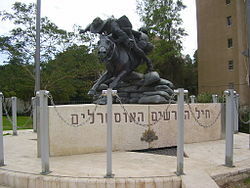 After Ori’s body was found in the forest at Ein Yael, rumors, some graphic, circulated about her having been mutilated. Unease about these rumors lingered, but the police put out a message urging people not to believe them. They certainly had reasons for issuing this call: It is possible that some of those rumors were exaggerations; certainly they were attempting to preserve the honor of the deceased and spare the immediate family further pain and grief. But at least some of those rumors were true. Ori was raped before being knifed to death. And it seems her body was then mutilated. On Monday news broke of the arrest of the terrorist. The reports were accompanied by pictures: The terrorist has scratches and marks across his face, signs of the fight Ori put up. And he is smirking, visibly proud of what he did. This is the face of evil. See it for yourselves. My immediate, visceral response: An urgent desire to smack him across the face so hard his head would go flying from his body. Many regret that he was brought in alive. But we only shoot terrorists when being apprehended if they try to flee or resist arrest. More’s the pity. Now there are cries for the death penalty. I do not know if this will happen, but it should. We have a law permitting the death penalty on the books but the accompanying legalities are complex (announcement that the death penalty is being sought must be made prior to proceedings, all three justices hearing the case must decide unanimously, etc.). The only one we have ever executed is Eichmann. A new bill that would have advanced the use of the death penalty in terror cases was put forward late last year, but never advanced to become law. “To ensure this option, the Cabinet must instruct the Attorney General and the Military Advocate General to refer the matter to a military court…. A. In any case where the terrorists can be tried in the framework of a military court, this should be done. B. In particularly cruel cases of murder, the Attorney General and the Military Prosecution should be instructed to demand a death sentence. “The ‘Palestinians,’ a nationality invented…are the spiritual and practical descendants of the biblical tribe of Amalek, an enemy hated and feared by the people of Israel because of their penchant for attacking from the rear, killing the weakest and the slowest of the Israelites. “The Jewish people are commanded (Deut. 25:19) ‘blot out the memory of Amalek from under heaven. Do not forget.’ This is generally understood to mean to completely destroy the tribe (see also I Samuel 15:3), but the rabbis decided that because of the way the various nations were scattered in history, it is impossible to determine who, if anyone, is a blood descendant of Amalek today. Nevertheless that commandment still has meaning. I would not go as far as the prophet Samuel and insist that we are required to kill every living creature in Amalek’s camp, but I understand it to mean that when faced with an antisemitic enemy, we are required to achieve full victory over it, to obtain what was called unconditional surrender after WWII. The search led Israeli security forces to Al-Bireh, near Ramallah, last Friday. There they entered the Jamal Abdel Nasser Mosque, where they confiscated footage from security cameras, and arrested an employee. This search was neither random nor futile. Shortly thereafter, our security forces arrested the terrorist in a building in Ramallah. When searching the building where he was hiding, our forces had the most able assistance of Zili, a Belgian Malinois who has been part of a Border Guard S.W.A.T. team for five years. Brings a smile to me and I hope to other dog lovers among my readers. “The occupation raided the Jamal Abd Al-Nasser Mosque…in El-Bireh. There was no mention, you will note, of the reason for the forces’ entry into the mosque, and no condemnation of the terrorist act. On Sunday, questions were raised about PA payments to be made to Irfaiya or his family – such payments being a routine aspect of PA policy (and I will be writing a good deal more about this). But the PA declared that it has not received any request for financial aid from the family. And anyway, explained an official with the Palestinian Prisoners’ Commission, even if the family does apply, it will takes weeks if not months because their eligibility is determined. The family in Hevron ‒ which is worried about a likely house demolition ‒ was quick to declare the innocence of this murderer who has not only confessed but acted out his attack for Israeli authorities. “Our family is not affiliated with Fatah or Hamas or any other faction. And so there you have it: No shame, no remorse, no readiness to accept responsibility. Just hypocrisy and lies that contradict each other: all in an attempt to cover the heinous and hateful behavior to which they are committed. As to the political scene, I will simply say here that I believe we must push for a strong right wing government. For only such a government understands and would be ready to take appropriate actions. There is much more to tell about the shifting dynamics of the campaign, but that must wait until my next posting. I consider it imperative that Americans, including those in governmental and leadership positions, be confronted with the truth regarding the Palestinian Arabs and the mood of Israelis, who are weary of platitudes and calls for patience. Weary of the would-be murderers within our midst. I implore you, my readers, to share this information as broadly as possible within all available venues. Forward this email, post it on your Facebook pages, write letters to the editor, etc. Previous Media release: Adelaide Holocaust Museum & Steiner Education Centre. Next It is antisemitic to oppose Israel’s right to exist.